Trigeminal neuralgia (TN), also known as tic douloureux, is a distinctive facial pain syndrome that may become recurrent and chronic. It is characterized by unilateral pain following the sensory distribution of cranial nerve V (typically radiating to the maxillary or mandibular area in 35% of affected patients) and is often accompanied by a brief facial spasm or tic. See the image below. Microscopic demonstration of demyelination in primary trigeminal neuralgia. A tortuous axon is surrounded by abnormally discontinuous myelin. (Electron microscope; 3300×). TN presents as attacks of stabbing unilateral facial pain, most often on the right side of the face. The number of attacks may vary from less than 1 per day to 12 or more per hour and up to hundreds per day. Attacks may provoke patients to grimace, wince, or make an aversive head movement, as if trying to escape the pain, thus producing an obvious movement, or tic; hence the term "tic douloureux"
No laboratory, electrophysiologic, or radiologic testing is routinely indicated for the diagnosis of TN, as patients with a characteristic history and normal neurologic examination may be treated without further workup. A blood count and liver function tests are required if therapy with carbamazepine is contemplated. Oxcarbazepine can cause hyponatremia, so the serum sodium level should be measured after institution of therapy. Trigeminal neuralgia (TN), also known as tic douloureux, is a common and potentially disabling pain syndrome, the precise pathophysiology of which remains obscure. This condition has been known to drive patients with trigeminal neuralgia to the brink of suicide. Although neurologic examination findings are normal in patients with the idiopathic variety, the most common type of facial pain neuralgia, the clinical history is distinctive. Trigeminal neuralgia is characterized by unilateral pain following the sensory distribution of cranial nerve V—typically radiating to the maxillary (V2) or mandibular (V3) area in 35% of affected patients (see the image below)—often accompanied by a brief facial spasm or tic. Isolated involvement of the ophthalmic division is much less common (2.8%). Typically, the initial response to carbamazepine therapy is diagnostic and successful. Despite obtaining this satisfying early relief with medication, patients may experience breakthrough pain that requires additional drugs and, in some patients, one or more of a variety of surgical interventions. The clinical description of trigeminal neuralgia can be traced back more than 300 years. Aretaeus of Cappadocia, known for one of the earliest descriptions of migraine, is credited with the first indication of trigeminal neuralgia when he described a headache in which "spasms and distortions of the countenance took place." Nicholaus Andre coined the term tic douloureux in 1756. In 1900, in a landmark article, Cushing reported a method of total ablation of the gasserian ganglion to treat trigeminal neuralgia. See also Trigeminal Neuralgia Surgery. 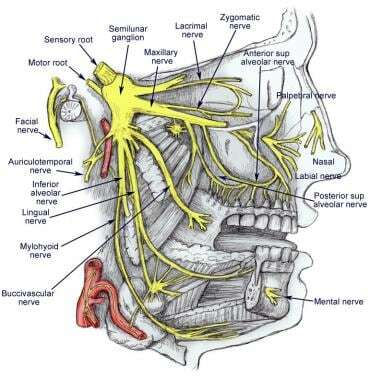 The trigeminal nerve is the largest of all the cranial nerves. It exits laterally at the mid-pons level and has 2 divisions—a smaller motor root (portion minor) and a larger sensory root (portion major). The motor root supplies the temporalis, pterygoid, tensor tympani, tensor palati, mylohyoid, and anterior belly of the digastric. The motor root also contains sensory nerve fibers that particularly mediate pain sensation. The gasserian ganglion is located in the trigeminal fossa (Meckel cave) of the petrous bone in the middle cranial fossa. It contains the first-order general somatic sensory fibers that carry pain, temperature, and touch. The peripheral processes of neurons in the ganglion form the 3 divisions of the trigeminal nerve (ie, ophthalmic, maxillary, and mandibular). The ophthalmic division exits the cranium via the superior orbital fissure; the maxillary and mandibular divisions exit via the foramen rotundum and foramen ovale, respectively. The proprioceptive afferent fibers travel with the efferent and afferent roots. They are peripheral processes of unipolar neurons located centrally in the mesencephalic nucleus of the trigeminal nerve. The image below depicts the anatomy of the trigeminal nerve. Because the exact pathophysiology remains controversial, the etiology of trigeminal neuralgia (TN) may be central, peripheral, or both. The trigeminal nerve (cranial nerve V) can cause pain, because its major function is sensory. Usually, no structural lesion is present (85%), although many investigators agree that vascular compression, typically venous or arterial loops at the trigeminal nerve entry into the pons, is critical to the pathogenesis of the idiopathic variety. This compression results in focal trigeminal nerve demyelination. The etiology is labeled idiopathic by default and is then categorized as classic trigeminal neuralgia. Neuropathic pain is the cardinal sign of injury to the small unmyelinated and thinly myelinated primary afferent fibers that subserve nociception. The pain mechanisms themselves are altered. Microanatomic small and large fiber damage in the nerve, essentially demyelination,  commonly observed at its root entry zone (REZ), leads to ephaptic transmission, in which action potentials jump from one fiber to another. A lack of inhibitory inputs from large myelinated nerve fibers plays a role. Additionally, a reentry mechanism causes an amplification of sensory inputs. A clinical correlate, for instance, is the potential for vibration to trigger an attack. However, features also suggest an additional central mechanism (eg, delay between stimulation and pain, refractory period). Although a questionable family clustering exists, trigeminal neuralgia (TN) is most likely multifactorial. Trigeminal neuralgia is divided into 2 categories, classic and symptomatic. The classic form, considered idiopathic, actually includes the cases that are due to a normal artery present in contact with the nerve, such as the superior cerebellar artery or even a primitive trigeminal artery. Symptomatic forms can have multiple origins. Aneurysms, tumors, chronic meningeal inflammation, or other lesions may irritate trigeminal nerve roots along the pons causing symptomatic trigeminal neuralgia. An abnormal vascular course of the superior cerebellar artery is often cited as the cause. 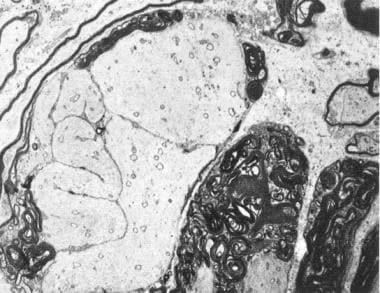 Uncommonly, an area of demyelination from multiple sclerosis may be the precipitant (see the following image); lesions in the pons at the root entry zone of the trigeminal fibers have been demonstrated. These lesions may cause a similar pain syndrome as in trigeminal neuralgia. Tumor-related causes of trigeminal neuralgia (most commonly in the cerebello-pontine angle) include acoustic neurinoma, chordoma at the level of the clivus, pontine glioma or glioblastoma,  epidermoid, metastases, and lymphoma. Trigeminal neuralgia may result from paraneoplastic etiologies. Vascular causes include a pontine infarct and arteriovenous malformation or aneurysm in the vicinity. Inflammatory causes include multiple sclerosis (common), sarcoidosis, and Lyme disease neuropathy. In 1968, Penman reported the US prevalence of trigeminal neuralgia (TN) as approximately 107 men and 200 women per 1 million people. By 1993, Mauskop noted approximately 40,000 patients have this condition at any particular time,  with an incidence of 4-5 cases per 100,000. More recent estimates suggest the prevalence is approximately 1.5 cases per 10,000 population, with an incidence of approximately 15,000 cases per year. Rushton and Olafson reported that approximately 1% of patients with multiple sclerosis (MS) develop trigeminal neuralgia,  whereas Jensen et al noted that 2% of patients with trigeminal neuralgia have multiple sclerosis. Patients with both conditions often have bilateral trigeminal neuralgia. No geographic tendency or racial differences have been found for trigeminal neuralgia. However, females are affected up to twice as often as males (range, 3:2 to 2:1). In addition, in 90% of patients, the disease begins after age 40 years, with a typical onset of 60-70 years (middle and later life). Patients who present with the disease when aged 20-40 years are more likely to suffer from a demyelinating lesion in the pons secondary to multiple sclerosis; younger patients also tend to have symptomatic or secondary trigeminal neuralgia . There have also been occasional reports of pediatric cases of trigeminal neuralgia. Another risk factor for this syndrome is hypertension. After an initial attack, trigeminal neuralgia (TN) may remit for months or even years. Thereafter the attacks may become more frequent, more easily triggered, disabling, and may require long-term medication. Thus, the disease course is typically one of clusters of attacks that wax and wane in frequency. Exacerbations most commonly occur in the fall and spring. Among the best clinical predictors of a symptomatic form are sensory deficits upon examination and a bilateral distribution of symptoms (but the absence thereof is not a negative predictor). Young age is a moderate predictor, but a fair degree of overlap exists. Lack of therapeutic response and V1 distribution are poor predictors. Although trigeminal neuralgia is not associated with a shortened life, the morbidity associated with the chronic and recurrent facial pain can be considerable if the condition is not controlled adequately. This condition may evolve into a chronic pain syndrome, and patients may suffer from depression and related loss of daily functioning. Individuals may choose to limit activities that precipitate pain, such as chewing, possibly losing weight in extreme circumstances. In addition, the severity of the pain may lead to suicide. The chief complication in trigeminal neuralgia is the adverse effects and toxicity experienced routinely with long-term use of anticonvulsant agents. Another complication is the waning efficacy over several years of these drugs in controlling neuralgia, necessitating the addition of a second anticonvulsant, which may cause more drug-related adverse reactions. Failure to diagnose a brainstem tumor and bone marrow aplasia as an idiosyncratic adverse effect of carbamazepine are common pitfalls to avoid. Standard care must be applied to invasive procedures, which are most subject to potential claims. Percutaneous neurosurgical procedures and microvascular decompression procedures pose risks of long-term complications. Perioperative risks also exist. See Trigeminal Neuralgia Surgery. Moreover, patients may have to wait for weeks or months after the operation for relief, and some find relief only for 1-2 years and then must weigh the option of a second operation. Some patients permanently lose sensation over a portion of the face or mouth. Occasionally, patients may suffer jaw weakness and/or corneal anesthesia. Corneal ulceration can result because of trophic disturbances from nerve deafferentation. After any invasive treatments, reactivation of a herpes simplex infection is not uncommon. The worst complication is anesthesia dolorosa, an intractable facial dysesthesia, which may be more disabling than the original trigeminal neuralgia. This dysesthesia may be caused by procedures and, sometimes, surgery. Patients benefit from an explanation of the natural history of the disorder, including the possibility that the syndrome may remit spontaneously for months or even years before they need to consider long-term anticonvulsant medications. For this reason, some may elect to taper off their medication after the initial attack subsides; thus, they should be educated about the importance of being compliant with their medication regimen. Patients also must be educated about the potential risks of anticonvulsant medications, such as sedation and ataxia, particularly in elderly patients, which may make driving or operating machinery hazardous. These drugs may also pose risks to the liver and the hematologic system. Document the discussion with the patient about these potential risks. No specific preventative therapy exists. Patients may have a premonitory atypical pain for months; therefore, appropriate recognition of this pre–trigeminal neuralgia syndrome may lead to earlier and more efficient treatment. Patients should avoid maneuvers that trigger pain. Once the diagnosis is established, advise them that dental extractions do not afford relief, even if pain radiates into the gums. In patients wishing to undergo a procedure, they should be aware of potential adverse effects, as well as report any altered sensation in the face, especially after a procedure. They should be informed about the potential for anesthesia dolorosa. Some patients may wish to consult the resources below. For patient education information, see Brain & Nervous System Center, as well Trigeminal Neuralgia (Facial Nerve Pain), Tic Douloureux, and Pain Medications. The International Classification of Headache Disorders: 2nd edition. Cephalalgia. 2004. 24 Suppl 1:9-160. [Medline]. Burcheil KJ. Trigeminal neuralgia. In: Conn's Current Therapy. 1999:948-50. Burchiel KJ. Abnormal impulse generation in focally demyelinated trigeminal roots. J Neurosurg. 1980 Nov. 53(5):674-83. [Medline]. Devor M, Amir R, Rappaport ZH. Pathophysiology of trigeminal neuralgia: the ignition hypothesis. Clin J Pain. 2002 Jan-Feb. 18(1):4-13. [Medline]. Anderson VC, Berryhill PC, Sandquist MA, Ciaverella DP, Nesbit GM, Burchiel KJ. High-resolution three-dimensional magnetic resonance angiography and three-dimensional spoiled gradient-recalled imaging in the evaluation of neurovascular compression in patients with trigeminal neuralgia: a double-blind pilot study. Neurosurgery. 2006 Apr. 58(4):666-73; discussion 666-73. [Medline]. Hess B, Oberndorfer S, Urbanits S, Lahrmann H, Horvath-Mechtler B, Grisold W. Trigeminal neuralgia in two patients with glioblastoma. Headache. 2005 Oct. 45(9):1267-70. [Medline]. Mauskop A. Trigeminal neuralgia (tic douloureux). J Pain Symptom Manage. 1993 Apr. 8(3):148-54. [Medline]. Rushton JG, Olafson RA. Trigeminal neuralgia associated with multiple sclerosis. A case report. Arch Neurol. 1965 Oct. 13(4):383-6. [Medline]. Jensen TS, Rasmussen P, Reske-Nielsen E. Association of trigeminal neuralgia with multiple sclerosis: clinical and pathological features. Acta Neurol Scand. 1982 Mar. 65(3):182-9. [Medline]. Limonadi FM, McCartney S, Burchiel KJ. Design of an artificial neural network for diagnosis of facial pain syndromes. Stereotact Funct Neurosurg. 2006. 84(5-6):212-20. [Medline]. Fromm GH, Terrence CF, Chattha AS, Glass JD. Baclofen in trigeminal neuralgia: its effect on the spinal trigeminal nucleus: a pilot study. Arch Neurol. 1980 Dec. 37(12):768-71. [Medline]. Patten J. Trigeminal neuralgia. In: Neurological Differential Diagnosis. 2nd ed. London: Springer. 1996:373-5. Sands GH. Pain in the face. Headaches in Adults, Annual Course, American Academy of Neurology Annual Meeting. 1994. 3:146:130-2. Eller JL, Raslan AM, Burchiel KJ. Trigeminal neuralgia: definition and classification. Neurosurg Focus. 2005 May 15. 18(5):E3. [Medline]. Türp JC, Gobetti JP. Trigeminal neuralgia versus atypical facial pain. A review of the literature and case report. Oral Surg Oral Med Oral Pathol Oral Radiol Endod. 1996 Apr. 81(4):424-32. [Medline]. Vincent M. SUNCT, lacrimation, and trigeminal neuralgia. Cephalalgia. 1998 Mar. 18(2):71. [Medline]. Goadsby PJ, Lipton RB. A review of paroxysmal hemicranias, SUNCT syndrome and other short-lasting headaches with autonomic feature, including new cases. Brain. 1997 Jan. 120 (Pt 1):193-209. [Medline]. Majoie CB, Hulsmans FJ, Castelijns JA, Verbeeten B Jr, Tiren D, van Beek EJ, et al. Symptoms and signs related to the trigeminal nerve: diagnostic yield of MR imaging. Radiology. 1998 Nov. 209(2):557-62. [Medline]. Tanaka T, Morimoto Y, Shiiba S, Sakamoto E, Kito S, Matsufuji Y, et al. Utility of magnetic resonance cisternography using three-dimensional fast asymmetric spin-echo sequences with multiplanar reconstruction: the evaluation of sites of neurovascular compression of the trigeminal nerve. Oral Surg Oral Med Oral Pathol Oral Radiol Endod. 2005 Aug. 100(2):215-25. [Medline]. Cruccu G, Biasiotta A, Galeotti F, Iannetti GD, Truini A, Gronseth G. Diagnostic accuracy of trigeminal reflex testing in trigeminal neuralgia. Neurology. 2006 Jan 10. 66(1):139-41. [Medline]. Blom S. Trigeminal neuralgia: its treatment with a new anticonvulsant drug (G-32883). Lancet. 1962 Apr 21. 1:839-40. [Medline]. Dalessio DJ. Trigeminal neuralgia. A practical approach to treatment. Drugs. 1982 Sep. 24(3):248-55. [Medline]. Campbell FG, Graham JG, Zilkha KJ. Clinical trial of carbazepine (tegretol) in trigeminal neuralgia. J Neurol Neurosurg Psychiatry. 1966 Jun. 29(3):265-7. [Medline]. [Full Text]. Rockliff BW, Davis EH. Controlled sequential trials of carbamazepine in trigeminal neuralgia. Arch Neurol. 1966 Aug. 15(2):129-36. [Medline]. Beydoun A. Safety and efficacy of oxcarbazepine: results of randomized, double-blind trials. Pharmacotherapy. 2000 Aug. 20(8 Pt 2):152S-158S. [Medline]. Sist T, Filadora V, Miner M, Lema M. Gabapentin for idiopathic trigeminal neuralgia: report of two cases. Neurology. 1997 May. 48(5):1467. [Medline]. Khan OA. Gabapentin relieves trigeminal neuralgia in multiple sclerosis patients. Neurology. 1998 Aug. 51(2):611-4. [Medline]. Solaro C, Lunardi GL, Capello E, et al. An open-label trial of gabapentin treatment of paroxysmal symptoms in multiple sclerosis patients. Neurology. 1998 Aug. 51(2):609-11. [Medline]. Chogtu B, Bairy KL, Smitha D, Dhar S, Himabindu P. Comparison of the efficacy of carbamazepine, gabapentin and lamotrigine for neuropathic pain in rats. Indian J Pharmacol. 2011 Sep. 43(5):596-8. [Medline]. [Full Text]. Carrazana EJ, Schachter SC. Alternative uses of lamotrigine and gabapentin in the treatment of trigeminal neuralgia. Neurology. 1998 Apr. 50(4):1192. [Medline]. Lunardi G, Leandri M, Albano C, et al. Clinical effectiveness of lamotrigine and plasma levels in essential and symptomatic trigeminal neuralgia. Neurology. 1997 Jun. 48(6):1714-7. [Medline]. Zakrzewska JM, Chaudhry Z, Nurmikko TJ, et al. Lamotrigine (lamictal) in refractory trigeminal neuralgia: results from a double-blind placebo controlled crossover trial. Pain. 1997 Nov. 73(2):223-30. [Medline]. Loeser JD. The management of tic douloureux. Pain. 1977 Apr. 3(2):155-62. [Medline]. Braham J. Pain in the face. Br Med J. 1968 Aug 3. 3(5613):316. [Medline]. [Full Text]. Raskin NH. Trigeminal neuralgia. 2nd ed. 1988. He L, Wu B, Zhou M. Non-antiepileptic drugs for trigeminal neuralgia. Cochrane Database Syst Rev. 2006 Jul 19. 3:CD004029. [Medline]. Baker KA, Taylor JW, Lilly GE. Treatment of trigeminal neuralgia: use of baclofen in combination with carbamazepine. Clin Pharm. 1985 Jan-Feb. 4(1):93-6. [Medline]. Fromm GH, Terrence CF, Chattha AS. Baclofen in the treatment of trigeminal neuralgia: double-blind study and long-term follow-up. Ann Neurol. 1984 Mar. 15(3):240-4. [Medline]. Parekh S, Shah K, Kotdawalla H. Baclofen in carbamazepine resistant trigeminal neuralgia - a double-blind clinical trial. Cephalalgia. 1989. 9 (Suppl 10):392-3. Fromm GH, Terrence CF. Comparison of L-baclofen and racemic baclofen in trigeminal neuralgia. Neurology. 1987 Nov. 37(11):1725-8. [Medline]. Gilron I, Booher SL, Rowan MS, et al. A randomized, controlled trial of high-dose dextromethorphan in facial neuralgias. Neurology. 2000 Oct 10. 55(7):964-71. [Medline]. Allam N, Brasil-Neto JP, Brown G, Tomaz C. Injections of botulinum toxin type a produce pain alleviation in intractable trigeminal neuralgia. Clin J Pain. 2005 Mar-Apr. 21(2):182-4. [Medline]. DMKG study group. Misoprostol in the treatment of trigeminal neuralgia associated with multiple sclerosis. J Neurol. 2003 May. 250(5):542-5. [Medline]. Tatli M, Satici O, Kanpolat Y, Sindou M. Various surgical modalities for trigeminal neuralgia: literature study of respective long-term outcomes. Acta Neurochir (Wien). 2008 Mar. 150(3):243-55. [Medline]. [Guideline] International RadioSurgery Association. Stereotactic radiosurgery for patients with intractable typical trigeminal neuralgia who have failed medical management. Harrisburg, Pa: IRSA; 2009. (Radiosurgery practice guideline report; no. 1-03). Available at http://guideline.gov/content.aspx?id=14309. Accessed: April 8, 2011. Sweet WH. Percutaneous methods for the treatment of trigeminal neuralgia and other faciocephalic pain; comparison with microvascular decompression. Semin Neurol. 1988 Dec. 8(4):272-9. [Medline]. Pollock BE, Ecker RD. A prospective cost-effectiveness study of trigeminal neuralgia surgery. Clin J Pain. 2005 Jul-Aug. 21(4):317-22. [Medline]. Olson S, Atkinson L, Weidmann M. Microvascular decompression for trigeminal neuralgia: recurrences and complications. J Clin Neurosci. 2005 Sep. 12(7):787-9. [Medline]. Barbor, M. MVD Bests Gamma Knife for Pain in Trigeminal Neuralgia. Medscape Medical News. Available at http://www.medscape.com/viewarticle/852161. October 5, 2015; Accessed: October 22, 2015. Zakrzewska JM, Thomas DG. Patient's assessment of outcome after three surgical procedures for the management of trigeminal neuralgia. Acta Neurochir (Wien). 1993. 122(3-4):225-30. [Medline]. Asplund P, Blomstedt P, Bergenheim AT. Percutaneous Balloon Compression vs Percutaneous Retrogasserian Glycerol Rhizotomy for the Primary Treatment of Trigeminal Neuralgia. Neurosurgery. 2015 Oct 13. [Medline]. Tan LK, Robinson SN, Chatterjee S. Glycerol versus radiofrequency rhizotomy - a comparison of their efficacy in the treatment of trigeminal neuralgia. Br J Neurosurg. 1995 Apr. 9(2):165-9. [Medline]. Cappabianca P, Spaziante R, Graziussi G, et al. Percutaneous retrogasserian glycerol rhizolysis for treatment of trigeminal neuralgia. Technique and results in 191 patients. J Neurosurg Sci. 1995 Mar. 39(1):37-45. [Medline]. Taha JM, Tew JM Jr. Treatment of trigeminal neuralgia by percutaneous radiofrequency rhizotomy. Neurosurg Clin N Am. 1997 Jan. 8(1):31-9. [Medline]. Meglio M, Cioni B. Percutaneous procedures for trigeminal neuralgia: microcompression versus radiofrequency thermocoagulation. Personal experience. Pain. 1989 Jul. 38(1):9-16. [Medline]. Leksell L. Stereotactic radiosurgery in trigeminal neuralgia. Acta Chem Scand. 1971. 37:311-314. Kondziolka D, Lunsford LD, Flickinger JC, et al. Stereotactic radiosurgery for trigeminal neuralgia: a multi-institutional study using the gamma unit. J Neurosurg. 1996 Jun. 84(6):940-5. [Medline]. Kondziolka D, Perez B, Flickinger JC, et al. Gamma knife radiosurgery for trigeminal neuralgia: results and expectations. Arch Neurol. 1998 Dec. 55(12):1524-9. [Medline]. Deinsberger R, Tidstrand J. Linac radiosurgery as a tool in neurosurgery. Neurosurg Rev. 2005 Apr. 28(2):79-88; discussion 89-90, 91. [Medline]. Kondziolka D, Lemley T, Kestle JR, Lunsford LD, Fromm GH, Jannetta PJ. The effect of single-application topical ophthalmic anesthesia in patients with trigeminal neuralgia. A randomized double-blind placebo-controlled trial. J Neurosurg. 1994 Jun. 80(6):993-7. [Medline]. Türk U, Ilhan S, Alp R, Sur H. Botulinum toxin and intractable trigeminal neuralgia. Clin Neuropharmacol. 2005 Jul-Aug. 28(4):161-2. [Medline]. Gilron I, Booher SL, Rowan JS, Max MB. Topiramate in trigeminal neuralgia: a randomized, placebo-controlled multiple crossover pilot study. Clin Neuropharmacol. 2001 Mar-Apr. 24(2):109-12. [Medline]. Zvartau-Hind M, Din MU, Gilani A, et al. Topiramate relieves refractory trigeminal neuralgia in MS patients. Neurology. 2000 Nov 28. 55(10):1587-8. [Medline]. Farago F. Trigeminal neuralgia: its treatment with two new carbamazepine analogues. Eur Neurol. 1987. 26(2):73-83. [Medline]. Beydown A, et al. Meta-analysis of comparative trials of oxcarbazepine versus carbamazepine in trigeminal neuralgia. Oxcarbazepine Study Group. Poster presented at the 21st American Pain Society Annual Meeting, Baltimore, Md; Mar 14-17, 2002. Bender MT, Pradilla G, Batra S, See AP, James C, Pardo CA, et al. Glycerol rhizotomy and radiofrequency thermocoagulation for trigeminal neuralgia in multiple sclerosis. J Neurosurg. 2013 Feb. 118(2):329-36. [Medline]. Jorns TP, Zakrzewska JM. Evidence-based approach to the medical management of trigeminal neuralgia. Br J Neurosurg. 2007 Jun. 21(3):253-61. [Medline]. Sandell T, Eide PK. Effect of microvascular decompression in trigeminal neuralgia patients with or without constant pain. Neurosurgery. 2008 Jul. 63(1):93-9; discussion 99-100. [Medline]. Truini A, Galeotti F, Haanpaa M, Zucchi R, Albanesi A, Biasiotta A, et al. Pathophysiology of pain in postherpetic neuralgia: A clinical and neurophysiological study. Pain. 2008 Oct 25. [Medline]. Magnetic resonance image (MRI) with high resolution on the pons demonstrating the trigeminal nerve root. In this case, the patient with trigeminal neuralgia has undergone gamma-knife therapy, and the left-sided treated nerve (arrow) is enhanced by gadolinium.